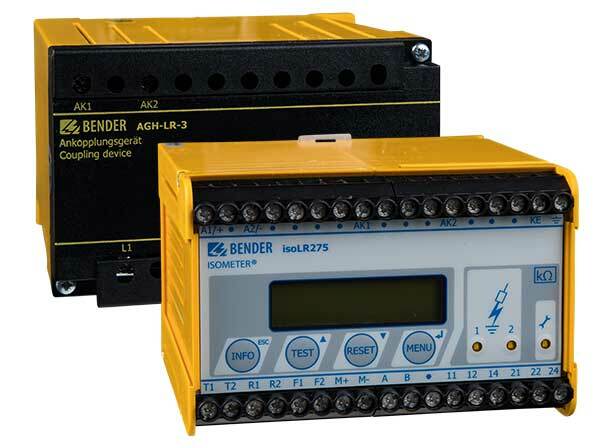 The isoLR275 ISOMETER® in conjunction with the AGH-LR coupling device monitors the insulation resistance of IT systems. It is suitable for universal use in 3(N) AC, AC/DC and DC systems. AC systems may include extensive DC-supplied loads, such as converters or thyristor-controlled DC drives. The adaptation to the existing system leakage capacitances takes place automatically. Only use the AGH-LR coupling device supplied with the device for adaptation of the nominal voltage range.